When faced with a problem, it often helps to grab someone and talk it out. This is a great collaborative strategy to problem solving. Everyone has a different personality, and everyone sees the world in a different light. What happens, though, when the problem you have is with another person? A common answer is, “I just need to vent, to get this off my chest.” The drawback with handling your problem with another person is that it now becomes gossip. Gossiping is a cancer in any business or social environment. It builds walls and divides teams. A major issue in many workplaces is conflict resolution. Every business has conflict, but not every business handles it the same way. That is why it’s a topic that should be discussed clearly with your team. Workplaces are full of diverse personalities who communicate in unique ways. These differences in personalities are what make conflict resolution an uncomfortable and touchy subject. Prior to this meeting the ground rules need to be explained. For successful conflict resolution, there are four. Each side must listen fully to the other side before responding. Often when one party is explaining something that is bothering them the second party will feel defensive and want to jump in and explain why they did XYZ to justify their actions. There is nothing more frustrating than someone interrupting you, especially when trying to resolve a problem. The first person needs to listens to everything the other person has to say, and then the second person will have their opportunity to explain their side. This process is repeated until both sides have sufficiently made their case. Identify the issues clearly, professionally, and concisely. Unless the issue is identified, a resolution cannot be found. Consider this scenario, for example: This morning Betty came into work and she threw her purse on her desk and snapped at Sally when Sally said good morning. The reason why Betty snapped at Sally when Sally said good morning could be that Betty got a frustrating text from her child saying he’d forgotten his homework. This has nothing to do with Sally, yet the frustration was taken out on her, and this caused some tension between the two of them the rest of the day. In some cases this kind of tension can simmer and slowly build up to a boil, making it extremely important to have open communication with your co-workers. You may not always know what is going on in another person’s life, so try not to jump to conclusions. The final and most important rule is that there are to be no personal attacks, name-calling, or finger pointing. These are a sure fire way to get the other person on the defensive, and there is just no need for petty attacks in a work environment. When voices are raised, control of the conversation is lost. This prevents both parties from being able to continue the conversation with a level head. As soon as voices are raised each side needs to pause — maybe even step aside for a few moments — to regain their composure so that a civil conversation may continue. Having conflict in the workplace is okay; in fact, it actually can be healthy. 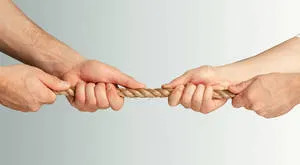 However, preventing conflict from turning into heated confrontation is crucial to avoid division in a business. If a resolution cannot be found with the two parties sitting down and talking it out, then it is time to bring in a mediator. Often this will be the site manager. Whoever it is, they need to remain as neutral as Switzerland. The mediator cannot and should not pick sides, and the same ground rules apply. Everyone wants to work in a happy, peaceful environment, so it’s important to talk it out. Chris Ciardello is a practice management consultant with Global Team Solutions. Chris has a distinctive knack for understanding the needs of work environments and assisting companies in building productive, cohesive teams. He holds a BA degree in marketing from the University of Texas, San Antonio. For more information on Chris Ciardello, please visit: www.GTSGurus.com.